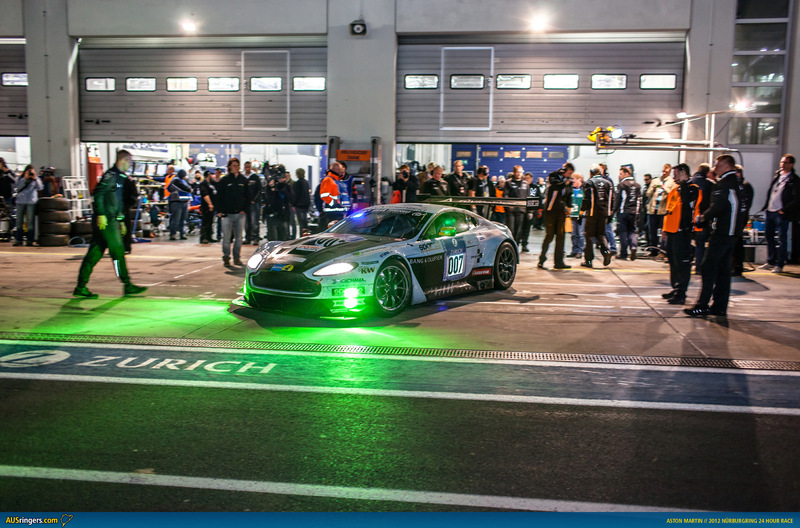 This year represented Aston Martin’s most serious effort at the Nürburgring 24 hour race since their debut in 2006. 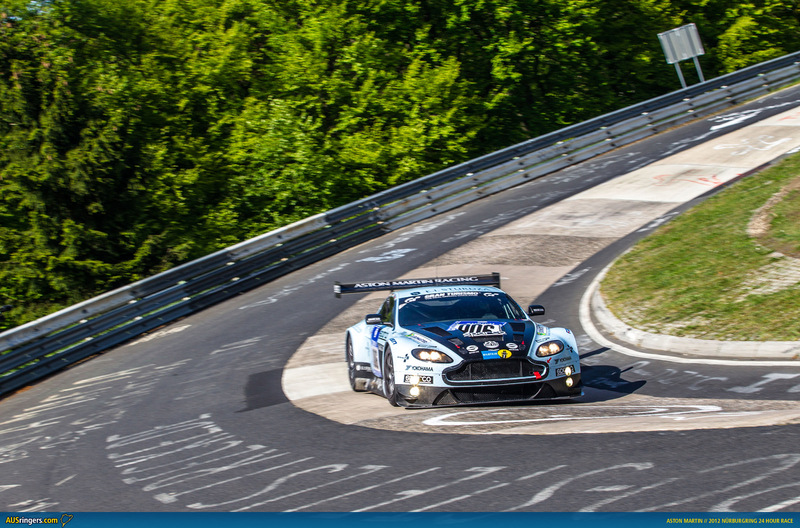 Yet things didn,t quite go according to plan for the #006 and #007 V12 Vantage GT3s. Both cars encountered trouble early in the race and from then on it was pretty much a test session. 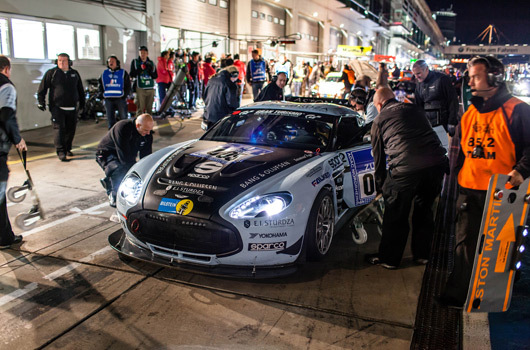 The other two factory Astons, the #005 V12 Zagato and #85 V8 Vantage GT4, with Aussie drivers Mal Rose and Rob Thomson in the crew, did relatively well, finishing 26th and 33rd outright. 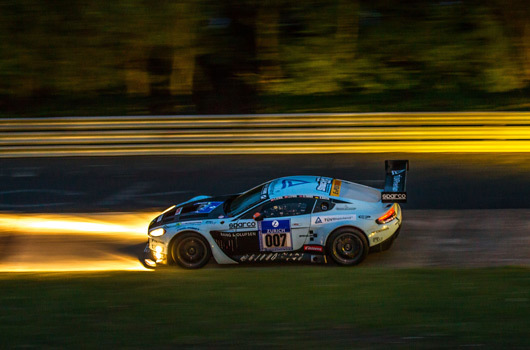 Moreover, they finished second and third in the SP8 class. 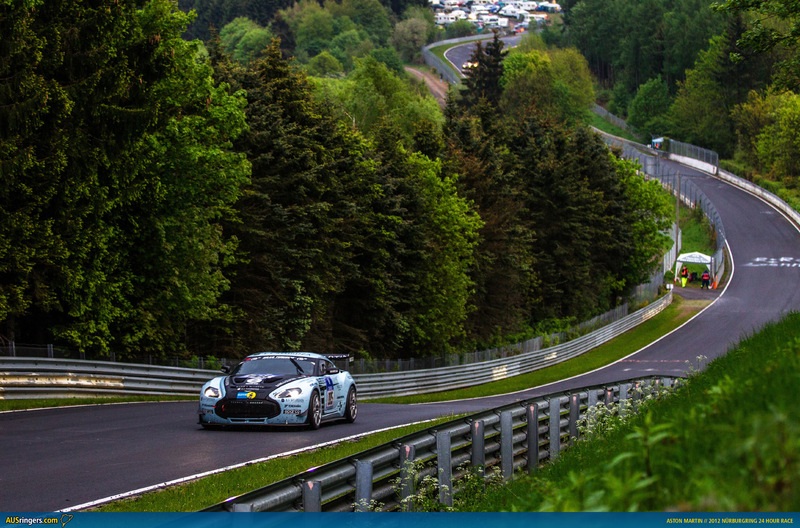 Undeterred by the disappointment of the GT3 cars, Aton Martin CEO Ulrich Bez, himself at the wheel of the #005 Zagato at the finish, remains confident there are better days ahead for Aston on the Green Hell. “We did very well with the #005 car this weekend,” said Dr Bez. “We had a flawless race while the drivers of the Vantage GT4 had fun and managed a good result as well. There were nine Aston Martins competing here and seven of them finished the race. There’s more from Aston after the break. Nürburg, 20 May 2012 – During a weekend in which the ADAC Zurich Nürburgring 24 Hours proved that it’s still every bit as challenging as ever, Aston Martin has successfully conducted a valuable testing exercise for its new-for-2012 V12 Vantage GT3 racing car, whilst its engineering department and customer race teams racked up three podium finishes across two classes. 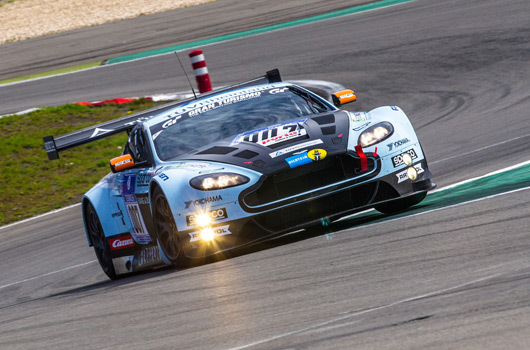 In partnership with its motorsport arm, Aston Martin Racing, and long-standing partner team, Young Driver AMR, Aston Martin entered a pair of V12 Vantage GT3s into this most gruelling of endurance races to further the development of the new Vantage-based racer. 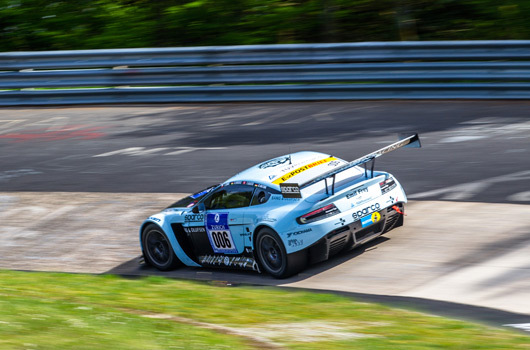 Having competed in the Nürburgring 24 Hours every year since 2006, this would represent the marque’s first foray into the headlining SP9 category for GT3 cars, making this Aston Martin’s most ambitious campaign at the 24-hour epic to date. The two V12 Vantage GT3s were crewed by professional driver line-ups, made up of Aston Martin Racing factory driver Stefan Mücke (D), Tomas Enge (CZ), Fredy Barth (CH) and Oliver Mathai (D) in the #006 car, with Darren Turner (GB) – also a factory driver – Dennis Rostek (D) and Johannes and Ferdinand Stuck – sons of triple Nürburgring 24 Hour winner Hans-Joachim Stuck – in the #007 car. 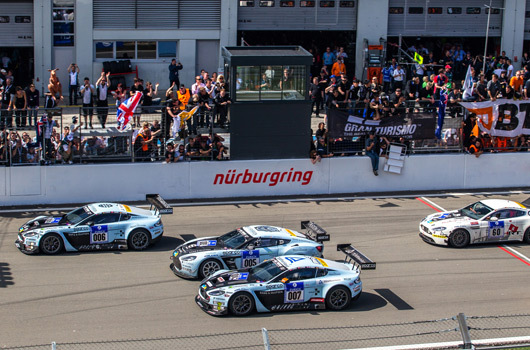 Running in matching sky blue and black liveries, the GT3s qualified in 17th and 16th positions respectively among a grid of 170 starters in the hands of Enge and Johannes Stuck. The race began at 1600hrs CET on Saturday (19 May). 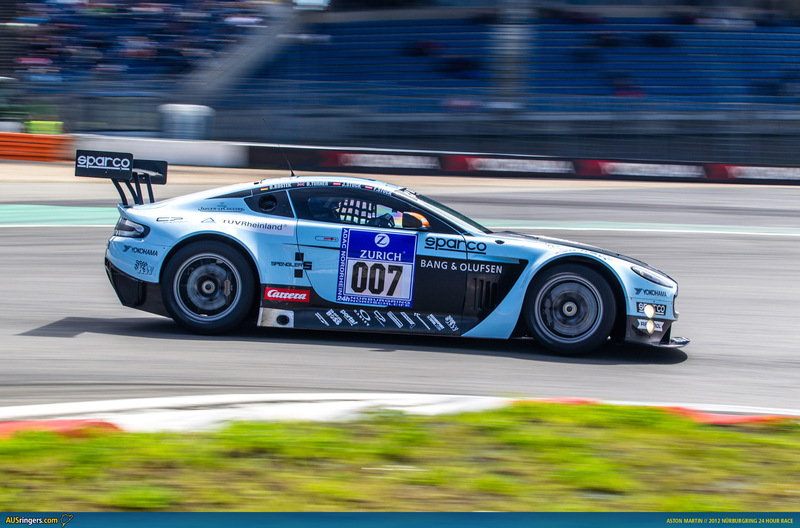 Both cars suffered early setbacks on their fourth tour of the 25-kilometre circuit; the #006 V12 Vantage GT3 developed a minor clutch issue which eventually cost it 15 laps to its SP9 rivals, while the #007 became stranded on the circuit following a tyre blow-out. 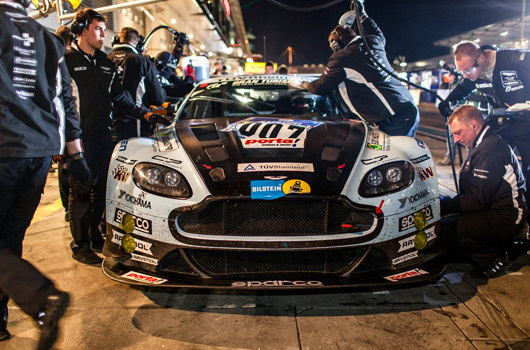 The Young Driver AMR technicians were able to transport a replacement wheel and tyre to the stricken car, which was back up and running again within 13 laps. 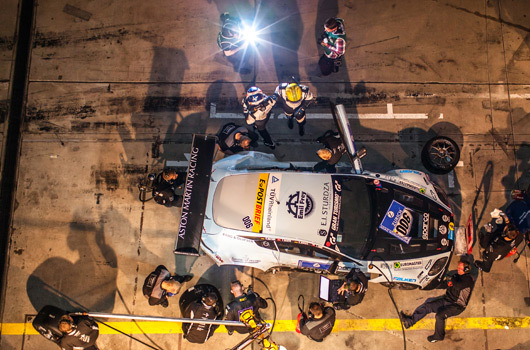 Both cars ran largely fault-free and at a competitive pace into the night and subsequent morning, only minor niggles such as a front splitter working itself loose spoiling an otherwise clean copybook. Having covered close to 5000-kilometres between them over the course of 20 hours – accruing invaluable data in the process – the team took the decision to rest both cars until the final lap of the race. 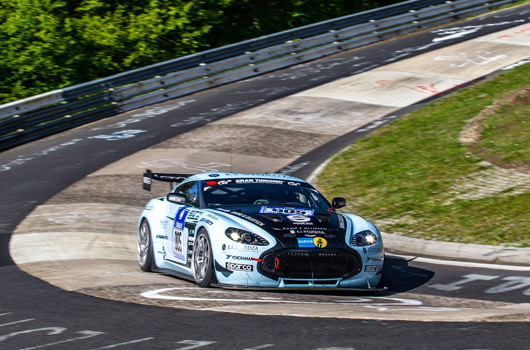 In addition to the pair of V12 Vantage GT3s, Aston Martin also fielded a V12 Zagato and a Vantage GT4 in the SP8 category, run by the same engineering department that had entered the Nürburgring 24 Hours every year since 2006 with a 100 per cent finishing record. The #005 V12 Zagato – running in the same livery as the V12 Vantage GT3s – was driven by Aston Martin CEO Dr Ulrich Bez (D), chief engineer Chris Porritt (GB), Nürburgring Test Centre Director Wolfgang Schuhbauer (D) and journalist Richard Meaden (GB). Aston Martin’s fourth official entry, an orange #85 Vantage GT4, was driven by Mal Rose (AUS), Robert Thomson (AUS), Jürgen Stumpf (D) and Peter Cate (GB). 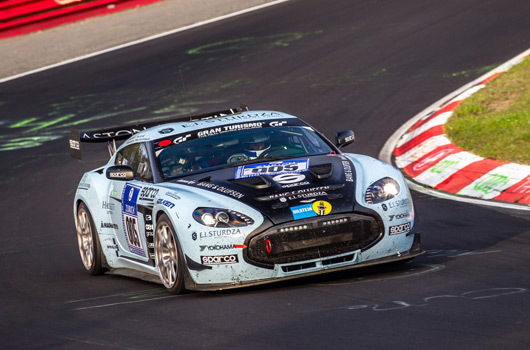 Having won the SP8 class twice since 2006, Aston Martin was hopeful of a strong showing. The qualifying performance bolstered such hopes when the #005 car set the third fastest time in its class and the #85 went second fastest. A quite remarkable 24 hours would follow for both cars, neither of which suffered any significant technical maladies despite the punishing nature of the Nordschleife circuit. None of the eight amateur drivers made any errors, either, despite the persistent rain that arrived in the early hours of Sunday morning. 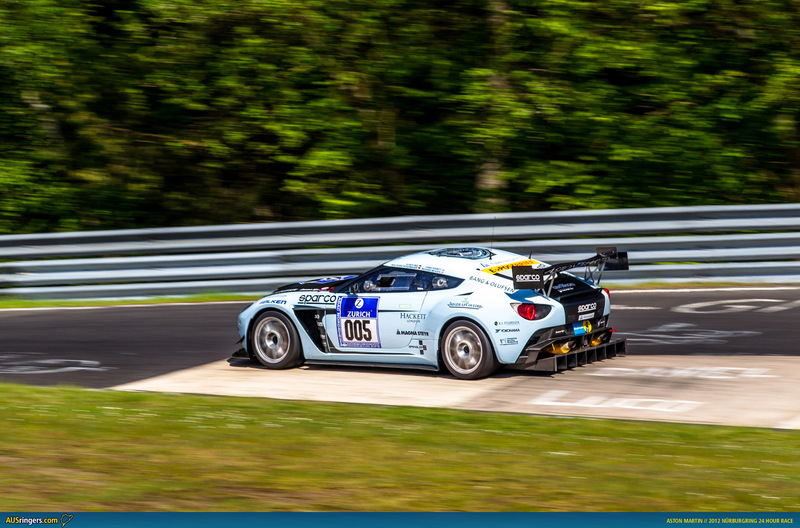 Having lapped the circuit 137 times the #005 V12 Zagato finished a strong second in class and 26th overall, while the #85 Vantage GT4 completed 135 laps to finish third in class behind the Zagato, and 33rd overall. Aston Martin’s third podium result came courtesy of customer outfit, Team Mathol Racing. Winner of the SP10 class in 2010, Team Mathol Racing was on course to repeat its success until an accident soon after the mid-way point. The team’s technicians were able to repair the damaged bodywork, enabling the Vantage GT4 to rejoin the fray and eventually battle on to second in class. 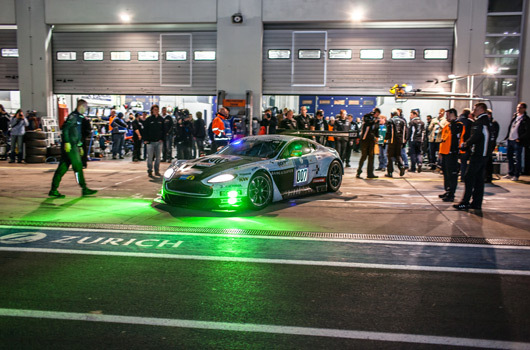 David King, Aston Martin’s Head of Motorsport, was delighted by the performance of all four cars: “The number one objective coming into this race was to get all of our cars home to maintain our 100 per cent finishing record in the Nürburgring 24 Hours and we’ve absolutely done that. 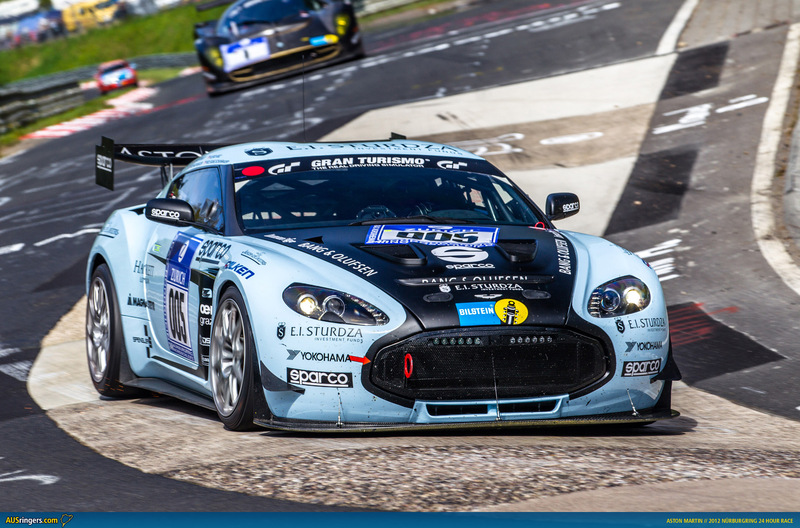 The second objective was to get class podiums with our V12 Zagato and Vantage GT4, which we also achieved. Aston Martin CEO Dr Ulrich Bez, who enjoyed the honour of crossing the finish line in the V12 Zagato, said: “We did very well with the #005 car this weekend. 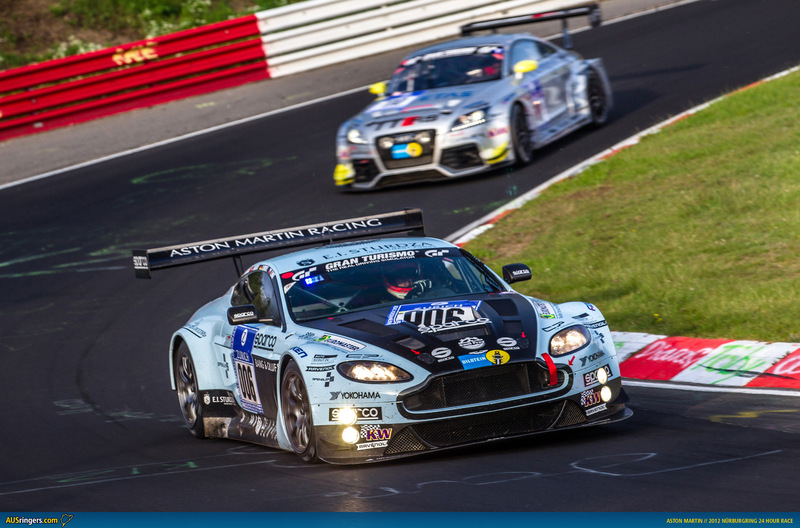 We had a flawless race while the drivers of the Vantage GT4 had fun and managed a good result as well. 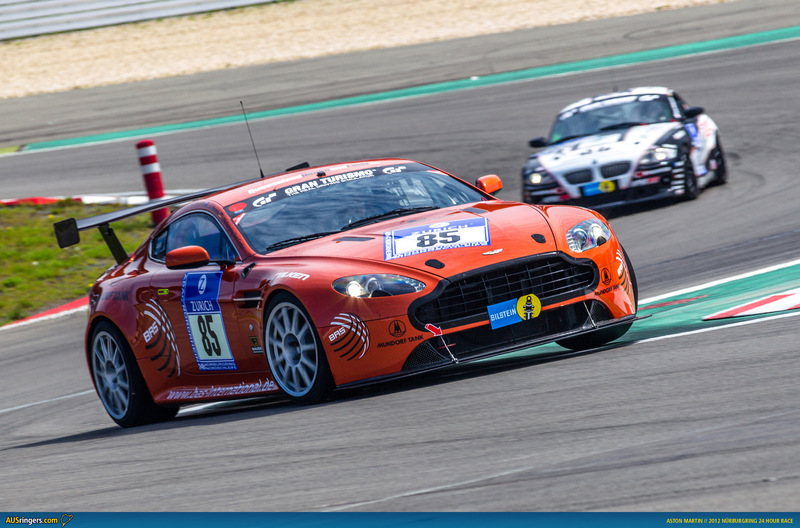 There were nine Aston Martins competing here and seven of them finished the race. Since the start of the 2012 motorsport season all of Aston Martin’s competition cars have been based on the Vantage road car. As a result, they all share its fundamental engine architecture, suspension design and bonded aluminium chassis, reflecting the Vantage’s status as Aston Martin’s sportiest road-going model.